One of the events that I look forward to each year is World of Pinot Noir which takes place at the beginning of March at the Bacara Resort in Santa Barbara. Wineries from throughout California, as well as other domestic locations, such as Oregon, and international regions, come together for a weekend of seminars, tastings and dinners focused on pinot noir. The 17th Annual World of Pinot Noir took place this weekend (March 3-4) and I flew back from the east coast and drove straight up to Santa Barbara in order to arrive in time. Each year I attend different seminars and this year was no different. This year, I attended the seminar and lunch series which included two vertical tastings of Grand Cru Vineyards from Louis Latour in Burgundy. We tasted 1999, 2002, 2005, 2010, 2012 and 2014 vintages of Romanée St Vivant les Quatre Journaux Domaine Latour AND Château Corton Grancey. 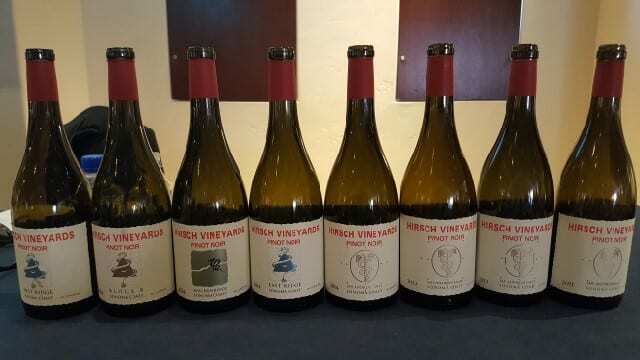 After this flight, we shifted to the Sonoma Coast and did a vertical of the Hirsch San Andreas Fault Estate Pinot Noir 2011-2014, as well as a horizontal of 2014 Estate Pinot Noirs [Hirsch West Ridge Estate Pinot Noir 2014; Hirsch East Ridge Estate Pinot Noir 2014; Hirsch Raschen Estate Pinot Noir 2014; Hirsch Block 8 Estate Pinot Noir 2014]. Both flights had delicious wines in them because, after all, they were all pinot noirs from Burgundy and the Sonoma Coast. I loved many of the Latour wines, especially the 1999 Château Corton Grancey and the 2005 Romanée St Vivant les Quatre Journaux Domaine Latour and recognize what a unique opportunity it was to taste those wines. But, the one wine that stood out above them all and is the Please The Palate Pick of the Week, is the Hirsch San Andreas Fault Estate Pinot Noir 2011 (average price $64.00). Hirsch Vineyards is located in a remote corner of West Sonoma Coast, located two-and-a-half miles from the ocean and one mile from the San Andreas Fault. David Hirsch purchased the property and planted it in 1980. Today, there are sixty-eight acres planted to pinot noir, all on its own rootstock. The San Andreas Fault is the flagship pinot noir for Hirsch Vineyards. Blending fruit from twenty-seven different blocks of pinot noir, this wine expresses the whole of the vineyard. The 2011 vintage was a difficult vintage. Spring was challenging with rain that resulted in shatter of the crop in many places. But Hirsch’s extreme site protected the vines which did not bloom until the terrible weather passed. The resulting wine is exquisite and was a stand-out in the tasting. It is structured yet juicy. Aromas of red berries, rose petals, sweet tobacco and spices are in harmony and on the palate it is silky, elegant and balanced. The Hirsch Vineyard 2011 San Andreas Fault Estate Pinot Noir wine is seamless and that is why it is my “pick-of-the-week”. This entry was posted in Wine and tagged Hirsch San Andreas Fault Estate Pinot Noir 2011, Hirsch Vineyards, pick of the week, Pinot Noir, Please The Palate, San Andreas Fault, World of Pinot Noir by Allison Levine.